The job of the wrist (carpus) is to position the hand for function and to transfer load from the hand to the arm. There are 8 bones in the wrist and they sit between the forearm and the hand. Each of these bones has joints around it and so in fact the wrist joint is a complicated joint made up of many joints. Arthritis has many causes but ultimately leads to a loss of the cartilage that sits between the bones in a joint. Cartilage is important as it allows for smooth, painless movement of a joint. When there is loss of cartilage in arthritis this leads to pain, stiffness and swelling. Who gets it and what causes it? In most patients arthritis occurs over time due to wear and tear (this is medically termed osteoarthritis). Other causes include inflammatory arthritis such as rheumatoid arthritis and psoriatic arthritis; and arthritis is also possible following an infection in the joint (known as septic arthritis). Scapholunate Advanced Collapse (SLAC) wrist. 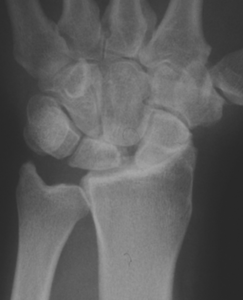 This form of arthritis occurs following a long standing injury to an important ligament which connects the scaphoid and lunate bones (two bones that make up the wrist). As the bones pull away from their original position due to loss of stability due to the injured ligament, they come to lie in an abnormal position. Over time this disturbs how the wrist moves and carries load leading to arthritis. Mr Naqui has a particular interest in the management of scapholunate ligament injuries, having done published research in this area. Link the blog on scapholunate research. 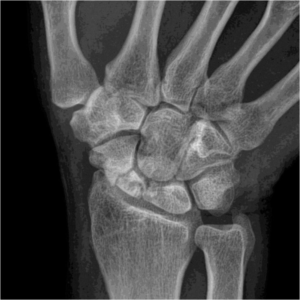 Scaphoid Non-Union Advanced Collapse (SNAC) wrist. This pattern of arthritis occurs following a fracture of the scaphoid bone (one of the bones of the wrist) that does not heal. The abnormal position of the fractured bone leads to a disturbance of wrist movement and abnormal pressure in the wrist leading to arthritis. Patients may experience pain, swelling and weakness in the wrist. Movements of the wrist may be painful and restricted. Grip strength is often reduced. Pain can be felt when attempting to load the wrist such as when getting out of a chair. On examining there can be pin-point tenderness over the affected area. The first step is to undergo a consultation, involving a medical history and clinical examination. Mr Naqui usually organises further tests such as an x-ray, CT scan or MRI scan. These may help to identify the extent of any arthritis and any associated fracture. Treatment will depend on the extent of arthritis. Initially conservative measures will be explored first including pain relief medication, splints and physiotherapy. If conservative measures are ineffective, a steroid injection can be given under x-ray control. If an injection does not give lasting relief, surgery may be indicated. The options available will be discussed in detail by Mr Naqui. What does the surgical treatment involve? Surgery may be performed under regional or general anaesthetic and is a day case procedure meaning that you will be able to go home the same day. Options may include debridement of the joint (which involves cleaning the wrist joint by removing debris) by keyhole, arthroscopic wrist surgery (hyperlnk required to my wrist arthroscopy section). 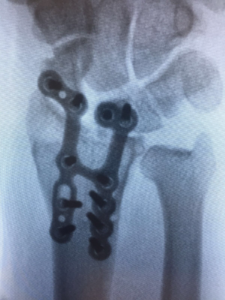 Open surgery options include types of wrist fusion (partial or total), removal of some wrist bones (proximal row carpectomy) and wrist replacement (hyperlink to wrist replacement). The merits of the various options will be discussed in detail by Mr Naqui. Taking simple painkillers such as paracetamol regularly for the first 2 days after the operation will help to relieve any post-operative pain. The wrist will be placed in a cast following the surgery for between 2 and 6 weeks, depending on the procedure. Any stitches inserted in the skin will be removed at around 10 days. Mr. Naqui and the hand therapist will then provide you with specific exercises to perform to regain strength and movements of the wrist. When I can return to normal activity? Activities which put significant stress on the wrist should be avoided for 3 months. Mr. Naqui will discuss with you regarding return to sports depending upon your particular sport, it maybe that you can have a protective splint to return to sport earlier. Driving can safely be resumed at around 6 weeks. Return to work is dependent on the nature of your work but usually expected within 2 weeks if it is non-manual work. You can discuss this with Mr Naqui at your consultation. The main potential complications that will be discussed with your prior to gaining consent for surgery include pain, swelling, infection, scarring, numbness, stiffness and ongoing weakness. Pain and swelling are common following surgery, these should settle after a few days with simple painkillers. Infection is rare. Stiffness at the joint should improve if you follow the exercise programme as advised by Mr Naqui and the hand therapist following surgery. Injury to nerves around the wrist may occur during surgery and lead to a feeling of numbness around the scar area. In a proportion of patients restoration of full strength and movement does not occur. If this were to happen then Mr Naqui will discuss further options with you. The risks of joint replacement surgery are discussed in a dedicated section on joint replacement (hyperlink to joint replacement).